The Nova Scotia Duck Tolling Retriever was originally developed in the early 19th century to toll (or lure) and retrieve waterfowl. These clever dogs were trained to run, jump and play along the shoreline to arouse the curiosity of nearby ducks and lure them close enough for their masters to shoot. The ducks were then retrieved by this proud breed. This dog normally lives up to 14 years of age. 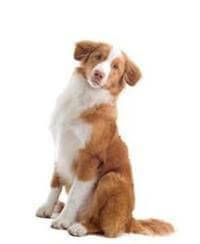 A well-trained Toller is extremely intelligent, outgoing and gentle, especially with children. In a normal caring household there should be no sign of any aggressive behaviour with people or with other animals. Being a retriever the Toller is bursting with energy and will require firm training from a young age to prevent it from running off during walks. While the Toller gets along with most animals, its natural retrieving instinct may prompt it to gently ‘round up’ any smaller pets in the home. However this habit can easily be controlled with kind but firm training. Bred to retrieve fowl from the icy rivers and lakes of Nova Scotia, the Toller has a waterproof double coat that needs weekly brushing to keep it clean and in good condition. The thick coat retains water and should be vigorously dried after a swim or wade in the water. The coat may have a slight wave on the back, but is otherwise straight. Some winter coats may form a long loose curl at the throat. These active dogs love company and will adapt comfortably to most environments. They can tolerate extreme weather conditions and are at their happiest when given plenty of space to run, play and explore. Click herefor advice on adopting a rescue dog and finding a breeder. All information has been provided by the Kennel Club.